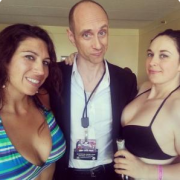 The Bikini Babes hijacked the podcast I was on! My appearance on a Geeks Without God podcast! Thank you Tim, Molly and Nick! I’d love to visit you again! This week’s guest is actor, puppeteer, and movie star Charles Hubbell! Charles joins us to talk about many things but primary among them is his work on Walking with the Enemy, a film currently playing in theaters! If you can find it in your area, you should to see it if only because we know a guy who is in the movie!!! Charles was a fascinating guest. He shared some stories about working with Ben Kingsley and even got around to answering our five questions. You should listen! He even did a little bit of Count LeShoc for our on our outro!! !